Barebells Functional Foods – We believe in eating happy and living healthy! What you already love, but with fewer carbs. Barebells Salty Peanut protein bar is creamy and soft and complete with real salted peanut chunks…all enrobed in sweet milk chocolate. All this for just 200 calories, 20g of protein and only 1.5g of sugar! Barebells Cookies & Cream protein bar is sure to satisfy any crazy, creamy craving. Nothing is more classic than cookies and cream, adapted from the most loved cookie in American history. Because for some reason, carrots just aren’t as satisfying as chocolate. Tired of eating bars that feel and taste like cardboard? In a blind taste test, this Caramel-Cashew protein bar won over the leading candy bars! This bar is far too gooey and chocolaty to compare to anything but the most decadent of desserts; and yet it has 20g of protein! Staying fit has never been this delicious. 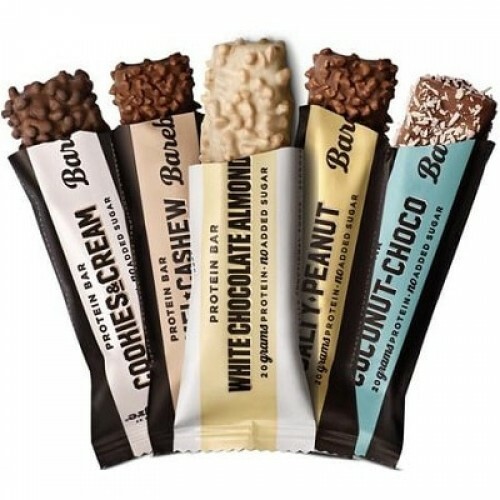 Barebells Coconut-Choco protein bar is absolutely exploding with coconut flavor, wrapped in creamy milk chocolate and smothered in real coconut flakes. Because you shouldn’t have to fight an endless battle between eating what you love, and having abs. Milk protein, milk chocolate (24%) (sweeteners: maltitols, cocoa butter, whole milk powder, cocoa mass, emulsifiers: soya lecithins, aromas), moisturizing agents: glycerol, isomaltooligosaccharides, collagen peptides, water, soybean pepper (soy protein isolate, cocoa, tapioca starch), palm fat, flavorings, sweeteners : Sucralose, acesulfame K.
Milk protein, milk chocolate (18.5%) (sweeteners: maltitols, cocoa butter, whole milk powder, cocoa mass, emulsifiers: soya lecithins, aromas), moisturizing agents: glycerol, isomaltooligosaccharides, collagen peptides, water, cashew nuts (5.5%), white chocolate , 5%) (with milk), groundnut paste, palm fat, fat-reduced cocoa powder, flavorings, sweeteners: sucralose, acesulfam K.
Milk protein, moisturizing agents: glycerol, milk chocolate (16%) (sweeteners: maltitols, cocoa butter, whole milk powder, cocoa paste, emulsifiers: soya lecithins, flavorings), isomaltooligosaccharides, collagen peptides, coconut flakes (6%), water, soybean pepper (soy protein isolate, tapioca starch, salt ), Palm fat, flavorings, sweeteners: sucralose, acesulfame K.
Eat 1-2 Bar daily to increase your protein intake or as needed to satisfy your protein or muscle-enhancing requirements.